2007 South Coast Winery "IL Temporale"
This Cal-Ital is a blend of 58% Sangiovese, 19% Cabernet Sauvignon, 13% Petit Verdot, and 10% Merlot sourced from Califonia's South Coast AVA. 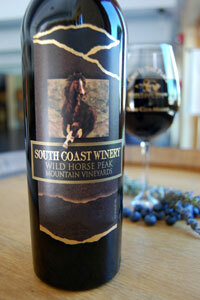 South Coast winery where the wine is produced and bottled is located in Temecula, California. Right away on the nose I get a good solid dose of oak. This creamy and toasted oak aroma combines with hints of jammy blackberry, spice, and sarsaparilla. On the palate the wine is also completely dominated by the toasted oak flavors. There is also some hints of black cherry and blackberry, but they are almost completely masked by the heavy and awkward oaky flavors. The wine finishes slightly off balance and bitter.